Sell to Us Price: $1,430.00 each. 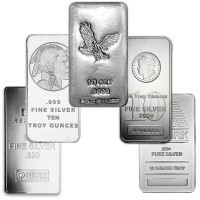 The 100 silver ounce bars are both cost effective and efficient to store. Investors get more ounces for their money while minimizing the amount of room needed to store their silver. And because these advantages make the 100 oz size popular, these bars are also liquid and easy to trade. Money Metals exchange carries bars from the most prominent refiners in North America including Republic Metals, Johnson Matthey, Royal Canadian Mint, the Engelhard silver bar and others. You can count on quality "brand name" bars that are trusted everywhere. Every bar we offer is .999+ pure silver, and clearly marked with the manufacturer, weight and purity. 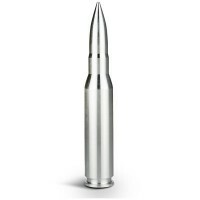 They are ideal for your precious metals IRA. 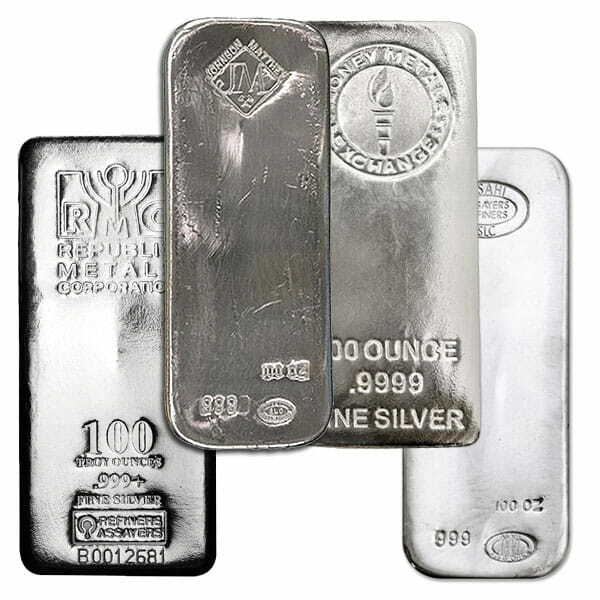 Silver bars are readily available in 1 oz, 5 oz, 10 oz, kilo, 100 oz or 1,000 ounce sizes. 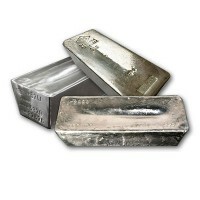 The largest size - 1,000 ounce silver bar - is best suited for investors who plan to store with Money Metals Depository. They are difficult to handle and ship, and will bring significantly less if removed from the vault system and therefore need to be melted and reassayed. 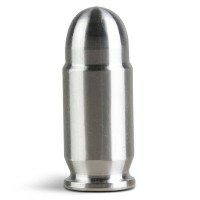 The 100 oz size is truly the "sweet spot" for investors who want low cost, portability, compact storage and liquidity. 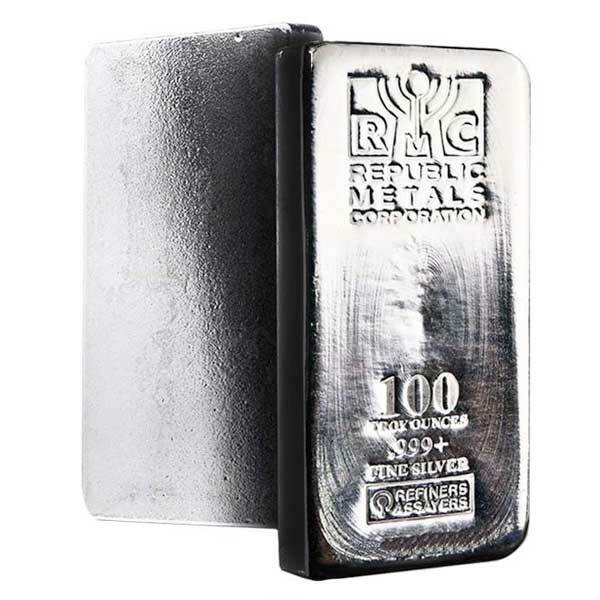 Larger silver bricks, such as the 100 oz fine silver bar size, may not be as practical for barter and they will limit the holder to transactions in 100 oz increments. For this reason, many investors may want some smaller sized bullion products as well. It is easy to imagine circumstances where the investor may need to raise a bit of cash by selling a few ounces rather than an entire bar. 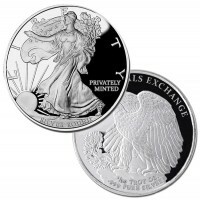 One ounce silver products such as mint silver American Eagles (check out American Silver Eagle prices on MMX), bullion rounds, or pre-1965 90% U.S. silver coins can be a good supplement to a core holding of bars. 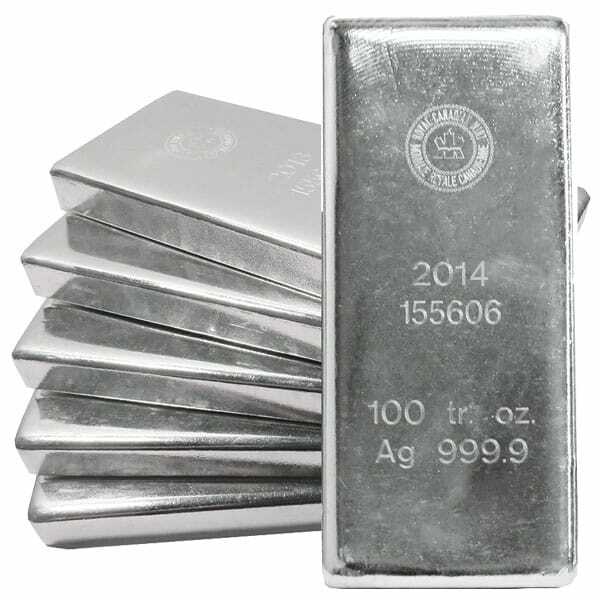 100 oz silver bullion bars are perfect for storage inside a precious metals IRA account. 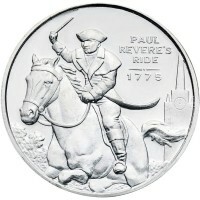 Silver held in an IRA is less likely to be needed in barter or smaller transactions. Instead investors can focus on maximizing investment returns by getting the most silver for their money. As silver prices appreciate those additional ounces will significantly boost investment performance. Now a word of caution when it comes to paying significantly more for a particular brand of 100 oz bar. Names such as Johnson Matthey and Engelhard are widely recognized and very popular. They are also no longer produced, as the companies behind them are no longer in business or have changed names. Paying a few cents additional premium to get bars with one of these names can perhaps be justified because the bars may well bring a few more cents when it is time to resell them. However, these bars should not be considered as collectibles and smart investors will avoid paying a bigger premium to get them. It may be that these bars are no longer made, but that does not mean they are scarce. The best idea is to focus on bars produced by recognized refiners with a great reputation for quality. When you buy from Money Metals Exchange, you can be assured that is what you will get. 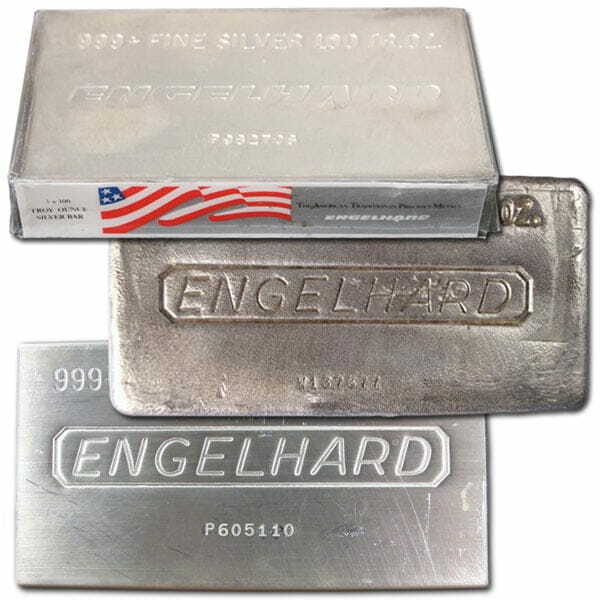 Buyers have a good chance of getting an Engelhard or Johnson Matthey bar without paying much, if any, additional premium for it. And, if you order by phone, our Specialists will be happy to tell you whether we have a particular brand of bar in stock. If we do, we'll set it aside for you. Our current buy pricing is $1,430.00 each and we will buy up to 5,000 ounces at this price. Simply call us on any weekday to lock pricing at 1-800-800-1865. I have some silver coins, but wanted a "hunk" of it because of prices being so low and close to the lowest price over the last 9 years, so I ordered a 100 oz bar. Ordering was easy and their chat line answered a couple of questions, as I'd never bought a silver BAR before. Even after the order, I called to request the bar be stamped by one of two different "makers" I guess, subject to availability at the time. The woman on the phone helped and was VERY nice. After my check cleared (I missed the debit card maximum by TWO DOLLARS, dang! ), I got an email stating it had cleared and when to expect delivery. In fact, the shipment came a bit more quickly than they estimated. I have absolutely zero complaints and they made the purchase very simple, answered all my questions with ease and in a professional manner. I would recommend Money Metals to anyone looking to protect their assets in an increasingly odd world...especially at current prices as of 11/19/18 -- today, as I write this. I had to sign for the shipment (of course) and the bar weighs a bit over 6 "regular" pounds...pretty heavy for its size. I can't imagine someone wanting a 1,000 oz bar delivered...it would weigh over 60 pounds! But now, at least I have a good mix of "junk" silver coins and now, a bar for wealth preservation purposes. Thank you, Money Metals! This was my first purchase from Money Metals (have purchased from other dealers in the past). I was very impressed. Price was excellent. The bar arrived quickly and was in excellent condition. I will definitely be buying from MMX in the future. Recently bought this bar as an investment project. Good pricing, great customer attention and support, good delivery speed, excellent purchase. I will surely buy as often as possible an MMX! Today I needed to sell for an unexpected emergency. I found out that when selling 100 ounce bars you don't get the spot price, you get the wholesale price. So ALTHOUGH you get lower premiums when you buy, you sell at a discount. 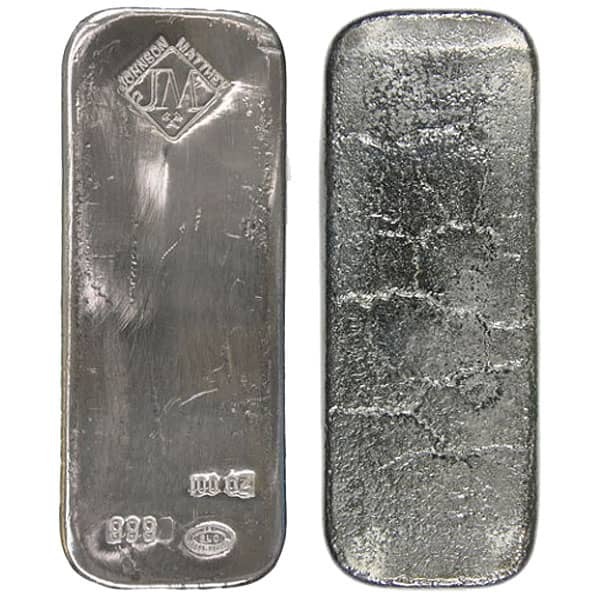 You can now sell your 100 Oz Silver Bars back to us online, at a price of $1,430.00 each!